iPad manufacturer Foxconn is replacing its notoriously suicidal workers with robots. You may recall that Foxconn, the massive Taiwanese contract manufacturer that produces the iPad and iPhone, as well as components for companies including Dell, Asus, Intel, Microsoft, Nintendo and Sony, was having some trouble last year. Despite the company's best efforts to prevent them, employees working at the massive Shenzhen factory kept on committing suicide. Though not as numerous as many news sources made them out to be, the suicides were a constant source of embarrassment for the company. In response Foxconn promised to pay its workers something that resembled a living wage, it piped calming music into its factories and put anti-suicide nets under their windows, it even got its workers to sign an agreement specifically stating they wouldn't try to off themselves. Now Foxconn is taking the next logical step. They're going to replace the fallible human workers with unfeeling automatons. Foxconn will be using the robots to do fairly mundane tasks such as spraying, welding and assembling components, jobs which currently belong to traditional meat-based workers. Terry Gou, founder and Chairman of Foxconn, announced that the company would be increasing Foxconn's current staff of robots from 10,000 to one million over the next three years. Foxconn, for the record, currently employs around 1.2 million people. Gou made this announcement last Friday evening at a worker's dance party, just in case workers were thinking of having a good time. The decision may be Foxconn's answer to numerous accusations of employee mistreatment. Robots, you understand, don't complain about poor wages, unpaid overtime, or being beaten by the security staff, nor do they care if the factory they're working in is built on top of a baby burial ground next to a haunted lake. 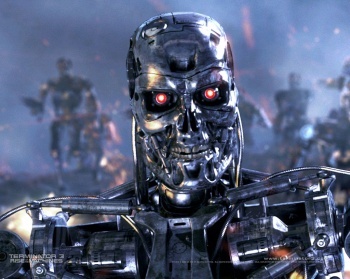 Most importantly, robots cannot self-terminate.